The average American man owns 12 pairs of shoes and the average American woman owns 27 pairs, according to the Center for the New American Dream in 2013. Unfortunately, I found I am above average – I own 33 pairs of shoes. I tend to hold on to shoes for decades. I made this episode so I could confirm that there are great options for recycling shoes that are no longer wearable. 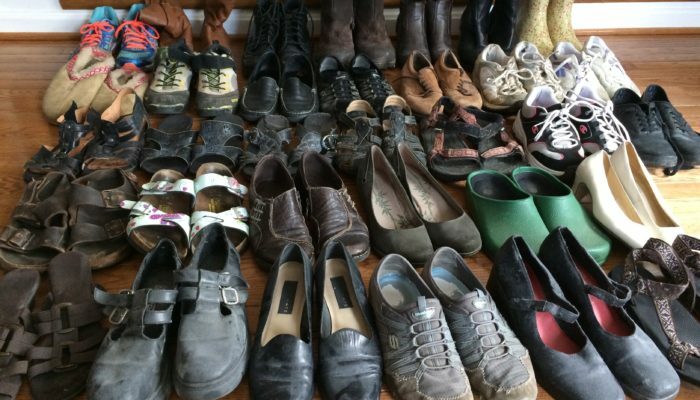 If you need suggestions on decluttering your shoes, I recommend the podcast “The Art of Decluttering” episode 58 on shoes. The Power of a Pair of Shoes from Soles4Souls on Vimeo. Does your Nike store gather worn out running shoes? Purchase slippers made from denim jeans.